When the superstar diva of the past decade doesn’t want to play the hero’s mother on screen, she insists that she be reshaped into the most beautiful woman in the world…by any means. This is just one of the many odd situations which plastic surgeon Dr. Dhruv faces in Mumbai. He has dealt with tyrannical bosses and finicky patients while undergoing his training, during which he has also won over a stunning doctor as his life partner. But satisfying the movie stars is a different ball game, because every girl wishes to have bee-stung lips, and every guy wants to flaunt a six-pack abdomen without working too hard. And all this while, he has to resist losing his balance over his ravishing female clients. Dr. Dhruv’s journey surpasses even a masala movie for humour, drama and action. In debunking many a myth about cosmetic surgeries, the book will enthrall those who can do Anything to Look Hot. When a professional person, decides to write about his/her profession, you can expect something as good as ‘Anything to look hot’. 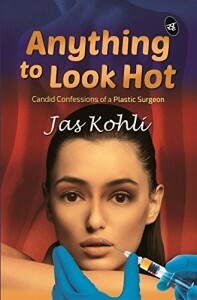 Jas Kohli is professional a plastic surgeon himself and with his debut write up, he had tried to put forward the life of a plastic surgeon in front of his readers. His protagonist, Dr. Dhruv Khanna, is a young plastic surgeon and with his first foot into the profession he started wondering about various things that each plastic surgeon must have gone through in his/her life. How far can a person go to retain the looks they had, or wish to have; how a doctor can fall in love with patient even knowing the consequences and many other things. The book starts up pretty slow but soon picks up the pace as the author gets used to with the theme and start to pour the insight over the reality of the business. Being a debutant, author had shown promising writing skills, the way he had described the character of Dhruv and his lady love Nandini is something to look forward in the book. Some of the scenes that the author had described are thought provoking and the way the author had put forward the whole book is something that leaves an impact over the heart of the reader. The only drawback with the book is that the author has gone pretty deep in describing the business of plastic surgery and had made the whole book look like an autobiography. The fiction part lacks. But overall the book has come up with something new in the market.